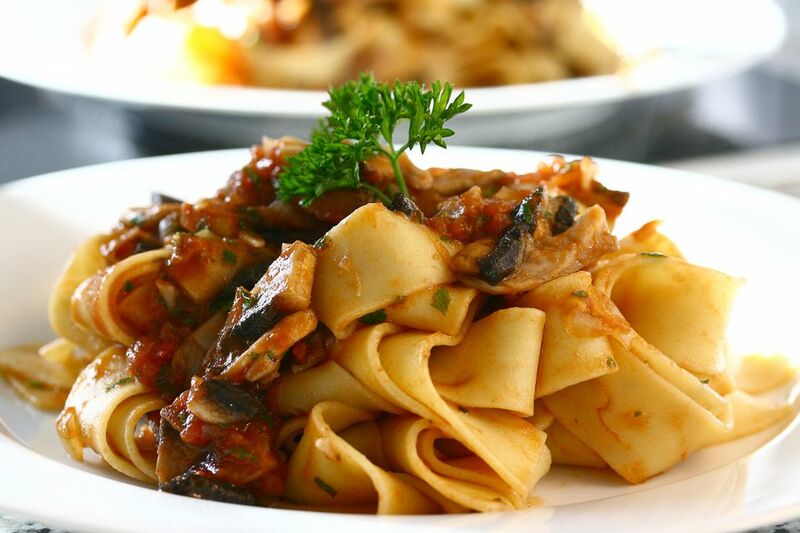 Pasta with a mushroom sauce known as "boscaiola" (meaning something like "forest-style" or "woodman's style") is one of the most common Italian restaurant dishes, and you will encounter it on menus throughout Italy. This recipe calls for porcini mushrooms, Boletus edulis, and they are necessary to do it justice. Ideally, you should use fresh porcini, but if you cannot find them you will have to make do by using a mixture of plain fresh mushrooms and dried porcini: purchase cultivated mushrooms and a 20-gram (1-ounce) packet of dried porcini (this will be about 1/2 cup, packed; if you want, you can use more, but don't exaggerate). Steep the dried mushrooms in warm water for 20 minutes, then mince them and add them to the cultivated mushrooms. Carefully strain the steeping liquid, since it may contain sand, and add it to the sauce as well. Another option, in the absence of fresh porcini, is to use whatever wild mushrooms are available where you live, combining them with some cultured mushrooms if need be and some steeped dried porcini. One last thing: This recipe calls for ​​pappardelle, which are broad (1-inch) strips of pasta. You can, if you want, use fettuccine (1/2-inch strips), tagliatelle, or a hollow form such as penne or . Clean the mushrooms, brushing the dirt away from the stems, and separate the caps from the stems; dice the stems and slice the caps, keeping them separate. Mince the shallots, garlic, and herbs and sauté them for about 3-4 minutes in 4 tablespoons of oil in a large pot. Add the diced stems, cook 1 more minute, and then add the tomatoes and 1/2 cup of the wine. Season with a little salt and black pepper and simmer the mixture over a very gentle flame for 30 minutes. Add a little more wine and a splash of water (or the liquid the mushrooms steeped in if you are using dried mushrooms), and the sliced caps. Continue simmering the sauce over a gentle flame until the pasta is ready. Depending upon how much moisture the mushrooms contain, you may need to add more liquid -- another splash of wine and a little hot water, or if you'd rather 1/4 cup of heavy cream, and if need be, a little water. In the meantime, bring pasta water to a boil, salt it, and cook the pappardelle. Drain the pasta and toss it with the sauce; then serve with grated cheese for those who want it.